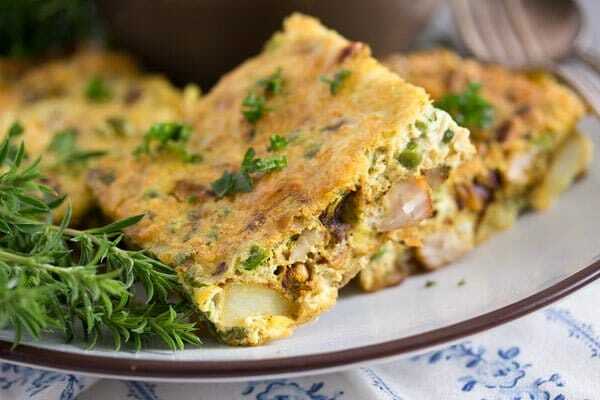 A flavorful and comforting Tunisian tajine or Tunisian frittata with chicken, potatoes, peas and lots of spices. The FIFA World Cup is coming to an end, but I am still quite in the middle of my World Cup Food series. There are still a lot of dishes that I have already cooked and photographed, which are waiting to be published and still about 4 or 5 that I have to cook. And it’s such fun to choose the recipes, to cook them and especially to eat the food. We got to eat so many amazing dishes during the past weeks… so great! You just have to try the Okonomiyaki, the Lamingtons or the Peri Peri Chicken. And these are only the first ones to come to mind, but they have all been so delicious, really without exception. Well, there was one exception of some totally failed Iranian pistachio cookies… but I am not going to post those… And by the way, is there a difference between chickpea flour and hummus flour? The recipe called for chickpea flour, but I could only find a bag of hummus flour, I thought that could be the mistake I’ve made, the cookies were a complete catastrophe. 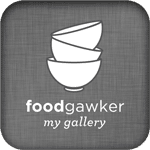 What is a Tunisian tajine? You might all have heard of a North-African tajine, especially of a Moroccan tajine. That is a dish named after a earthenware pot in which it is cooked, slow-cooked stews made with poultry, meat or fish together with vegetables, dried fruit, lots and lots of spices and yummy things like preserved lemons, for instance. However, a Tunisian tajine or Tajine maadnous is a completely different dish. 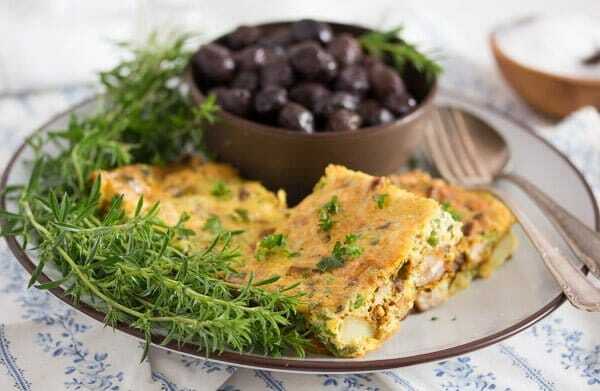 It is a kind of frittata, a bit similar to an Italian frittata or a Spanish tortilla. The Tajine maadnous is something you can enjoy not only in Tunesia, but also in parts of Algeria. Other similar dishes can be also found in other North-African countries, Egypt for instance. The Egyptians call their egg dish tagen or eggah. Basically, the Tunisian tajine is a dish made with lots of eggs mixed with meat and vegetables, nicely spiced and baked in the oven. An exquisite meal, I am telling you! 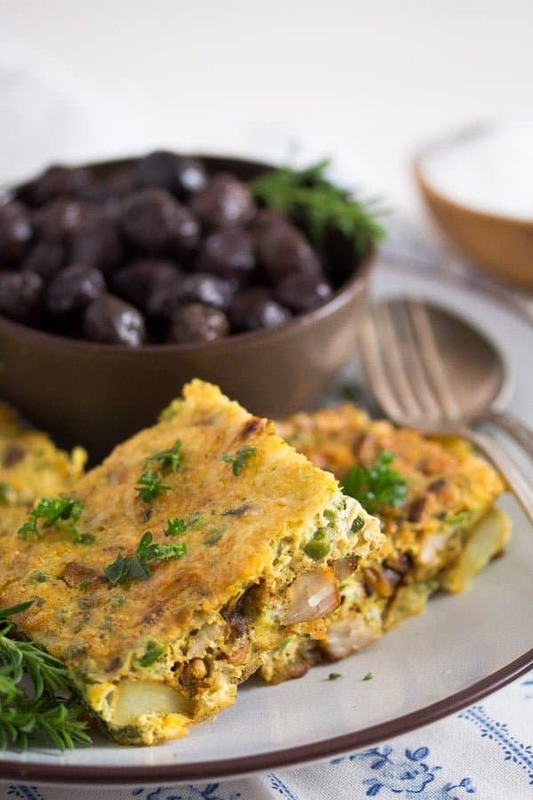 I’ve made this Tunisian frittata a couple of weeks ago for four adults and 3 children. I used the largest baking dish I have, whisked a huge batch of eggs and made a good large couscous salad (similar to this bulgur salad) to serve with the frittata. I thought that would be more than enough for all of us. Well, I was wrong. Despite the large and filling curried couscous salad, the Tunisian frittata was just not enough. The kids adored it and had 3 pieces each, which was something I could not have predicted. Bottom line, I was only able to eat one single piece of frittata myself, although I could have demolished 3 pieces on my own as well… Thank God, there was enough couscous salad there (the kids only ate about 1 spoonful of it each) or I would have had to make myself a cheese sandwich for lunch. The inspiration for this dish comes from Maroc Mama, but I’ve changed the recipe quite a bit. Start by cooking the onions, chicken and potatoes. I used equal amounts of chicken and potatoes and cooked the mixture until the potatoes were almost done. I had to check quite a few times in between and added a small splash of water from time to time. The potatoes were diced quite finely, about 1 cm/ 0.4 inches and needed about 8-10 minutes cooking time until almost done. But start checking after 5 minutes or so. I added 150 g/ 1 cup peas towards the end of the cooking time. I didn’t bother defrosting them, it happened in the few minutes they were in the pan. I used Gouda cheese for the Tunisian tajine, because that is what I had in the fridge. However, I can imagine that Cheddar, Gruyère and even Parmesan (or a mixture) would work well as well. When it comes to spices, be generous! 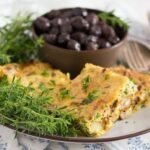 This Tunisian frittata should be bold in taste, more flavorful than an Italian frittata or a Spanish tortilla. I used turmeric, cayenne pepper, black pepper, ground cumin, ground coriander and ras-el-hanout to spice the tajine. Ras-el-hanout is a wonderful North-African spice mixture, which I also used in this recipe for Moroccan Chicken Stew with Olives and Tomatoes. The name can be translated as “head of the shop”, meaning that each shop selling it has its own version of ras-el-hanout and that they all use the best spices in their shop to make this spice mixture. The ras-el-hanout I have contains a special sort of pepper – piper cubeba and several other pepper sorts like long pepper, black pepper, monk’s pepper. Also coriander, ginger, cumin, cardamom, fennel seeds, turmeric, nutmeg, galgant, cloves, cinnamon and bay leaves. Don’t worry if you buy a jar of ras-el-hanout to make this recipe, you will be able to use the remaining ras-el-hanout in so many different ways. I put it into soups, for instance. 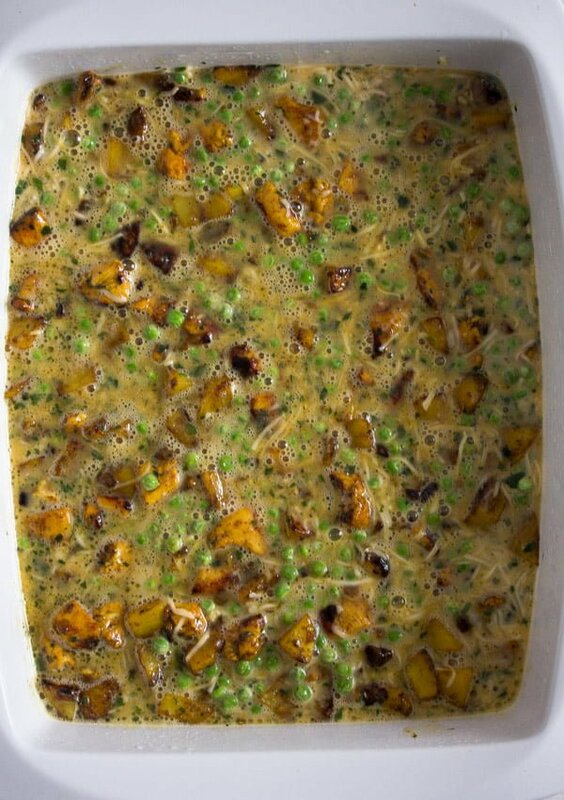 Try it in a pumpkin soup, any kind of soup using chickpeas or beans, either beef soup or a vegetarian kind. Try this Moroccan Tomato and Chickpea Soup with Couscous, it is delicious, we had it not long ago. 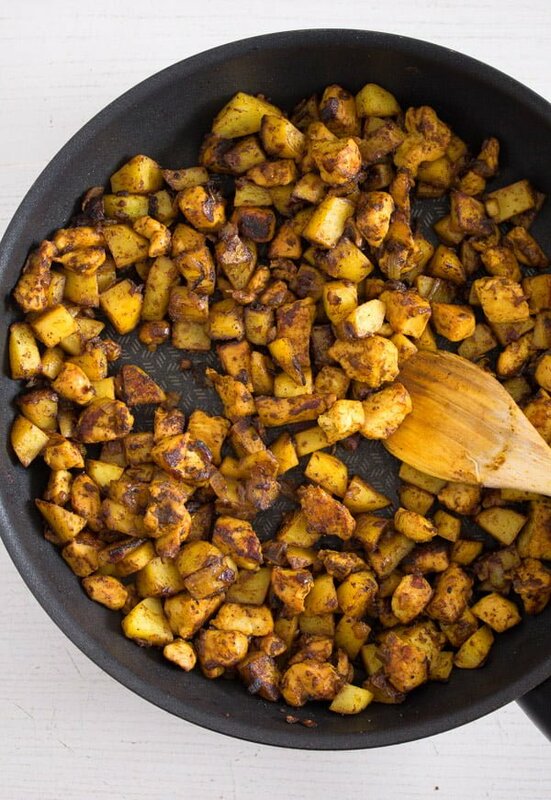 I also use ras-el-hanout to rub chicken breasts or drumsticks with it (mixed with a little olive oil), I sprinkle it on oven roasted potatoes or sweet potatoes, I put it in sweet potato, pumpkin or chickpea salads and I used small amounts of ras-el-hanout to flavor hummus or other bread spreads. 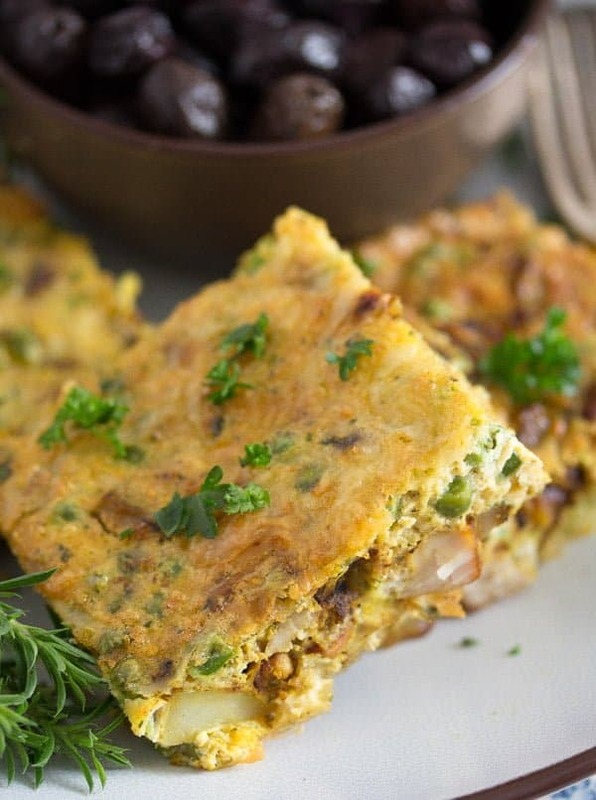 When the Tunisian frittata is baked, let it rest for 10 minutes. Cut into 8 rectangles and serve either warm or cold. You could serve it with tomato sauce or yogurt sauce. On the side you could make tabbouleh, bulgur or couscous salad, a green salad with vinaigrette or a tomato and onion salad. I also like to eat some pickles with this kind of egg dishes. The Tunisian tajine is a great food to take to a picnic or potluck party. Preheat the oven to 180 degrees Celsius/ 350 degrees Fahrenheit. Grease a ceramic baking dish (ca 20x20 cm/ 8x8 inches). Chop the onion finely. Dice the chicken into small cubes. Dice the potatoes into 1 cm/ 0.4 inch small cubes. Heat the oil in a large skillet or frying pan. Cook the onion until translucent, about 2-3 minutes. Add the chicken cubes, coriander, cumin, turmeric, ras-el-hanout, cayenne and black pepper and salt. Stir for about 2 minutes. Add the diced potatoes and the water. Saute for 5 to 10 minutes until the potatoes are almost cooked through. Add a little more water during this time, if necessary, and stir often. When the potatoes are almost done, add the peas and stir for a few more minutes. In the meantime whisk the eggs in a large bowl. Add the parsley, thyme and about ¾ of the grated cheese and stir well. 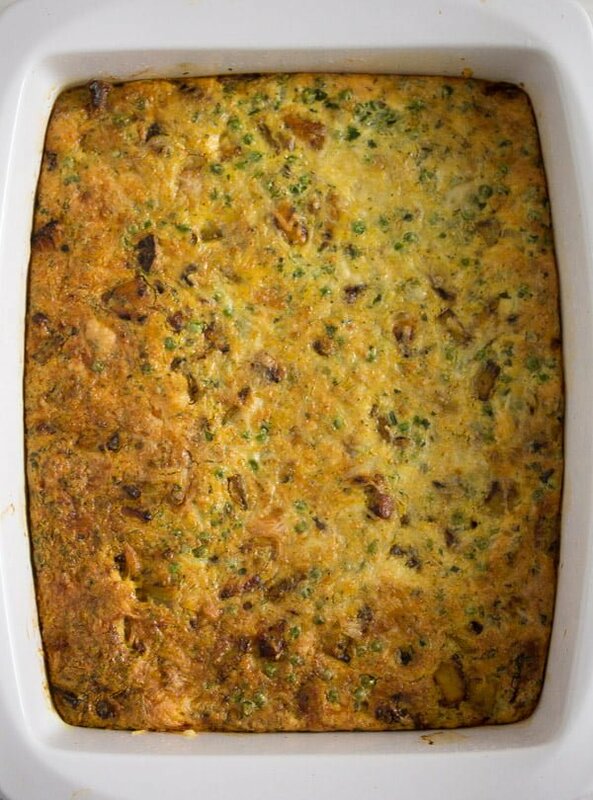 Give the chicken and potato mixture to the eggs, stir quickly and pour the mixture into the prepared baking dish. Sprinkle with the remaining grated cheese. Bake the Tunisian tajine for about 35 minutes or until set in the middle and golden. Let rest for 10 minutes and cut into 8 rectangles. Serve warm or cold as suggested above. 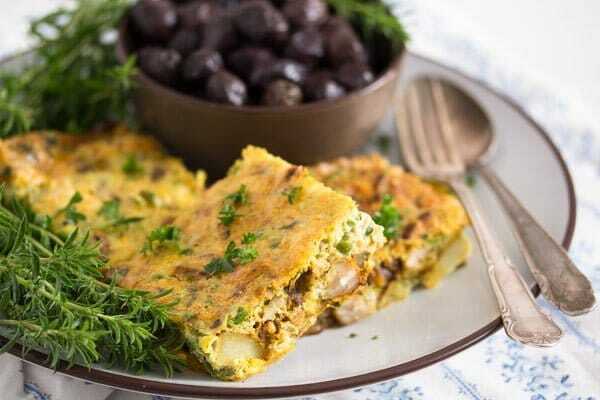 I always love frittata and all those spices that you have used in this are favourites too. This looks like a perfect weekday meal.